Tyson Gay (9.69): Winner of Olympic Trials in 2008, Silver medal in 2009. Beat Bolt in 2010 and was injured most of 2011. First race of 2012, 10.00. Definately not going to win Trials but for a season opener, not bad at all. When healthy, America’s most dominant sprinter, he’s run 9.69 (American Record), 19.58, and 44.89. Justin Gatlin (9.77 9.85): At one point a very promising young sprinter, He won Gold in Athens in 2004 at 100m, Bronze at 200m. But, he tested positive for some crap messing around with Trevor Graham (Marion Jones, Tim Montgomery, Justin Gatlin, Antonio Pettigrew, CJ Hunter) <—- Just a few of the athletes who tested positive for banned substances under his coaching. But he came back in 2011 and was 2nd at US Championships. He won Gold in Doha at 60m Indoor World Championships, has run 9.87 in 2012. Ryan Bailey (9.88): For some weird reason he was labeled as the answer to Usain Bolt…he is not that, probably never will be. But he is tall, 6 ft 4 and he is fast. He hasn’t had a spectacular 2012 campaign running only 10.01 but, he will more than likely go sub-10 at Trials. In hopes of making the Olympic team, Bailey moved to Cali to train with Walter Dix and Richard Thompson. 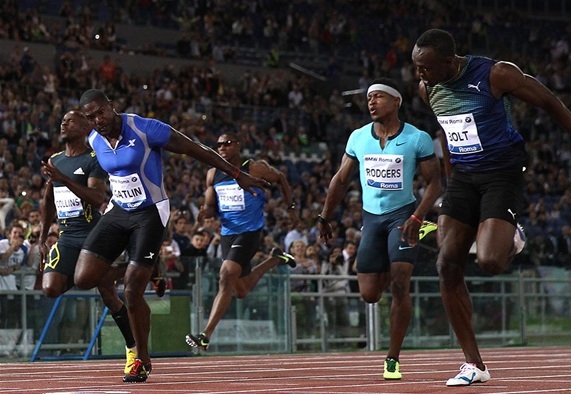 Jeff Demps (10.01): World Junior Record Holder at 100m, but has not been consistent at all. A two sport athlete at University of Florida (Football/Track) he has been apart of many NCAA Championship but is injured a lot. Pulled out of the 2012 NCAA Championships because of hamstring problems, hopefully he comes to Trials in good health because he has raw speed. Walter Dix (9.88): The Bronze medalist in Beijing, Dix is looking for a 100/200 double at this years trials. He has a PR of 19.53 in the 200, so expect something spectacular out of him later in the summer. Trains with Bailey and Richard Thompson, and he ran a 9.85 wind-aided in April. Mookie Salaam (9.97): Love his name, Mookie, Cookie, Rookie, Snooki…but he is a stellar athlete. He is also very fst at 200m (20.05), decided to forgo senior year at Oklahoma to focus on Trials, signed with Adidas and has run 9.98 this year. Mike Rodgers (9.85): Fast little guy, won US Championships in 2009. Has run 9.99 and 9.97 wind-aided in 2012. He ran his PR at Pre Classic in 2011, maybe he will have a good showing in Eugene this year? Doc Patton (9.89): The man who dropped the baton in Daegu, has put a lot of pressure on himself this year because of a disappointing conclusion to his 2009/2011 campaign. Has ran 10.04 in 2012. Gatlin, Rodgers and Gay will be rockin’ that Red singlet in August.